As Pavel Florensky imaginatively said, the legendary Makovets knoll, on which St. Sergius of Radonezh founded his monastery, became “a focused elevation of Russian culture”. Thus it was no accident that the founders of “Art and Life”, an association of artists and writers established in the spring of 1921, chose this old name as the title for their magazine, and later it became the official name of the group itself. 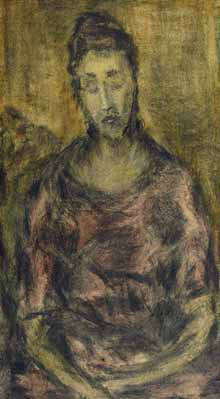 At that time a sublime spirituality of art was a vital necessity, and the line of succession from the Russian religious and philosophical tradition to the artists and writers, and the latters’ firm conviction that art was directly connected not only with an aspiration for an aesthetic ideal but with an aspiration for moral selfimprovement as well, has never ceased to amaze us. So it comes as no surprise that the exhibition of the “Makovets” artists’ drawings, marking the 85th anniversary of the publication of the first issue of the magazine, titled like the group “Makovets”, inspired such great interest. 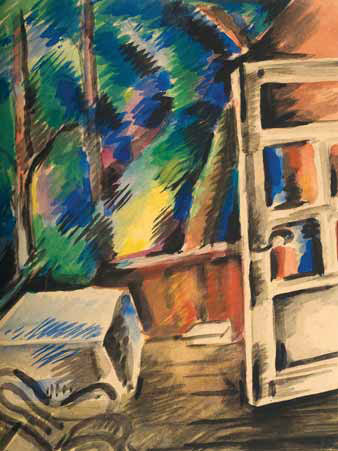 The artistic union of kindred spirits came out of the liberal creative atmosphere of the editorial team of the “Mlechnyi Put” (Milky Way) magazine (published from 1914 to 1917), headed by the talented poet and patron of the arts Alexei Chernyshev. He was whole-heartedly devoted to art and helped, without asking for anything in return, gifted young writers, many of whom went on to become famous poets and authors. 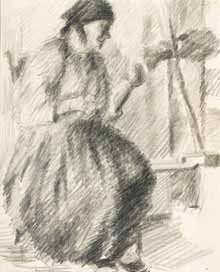 The art section was edited by his brother Nikolai Chernyshev, a would-be prominent painter, graphic artist and muralist. They were both directly involved with the creation of the future Union — the brothers had a knack for finding and bringing together all that was forward-minded and talented. 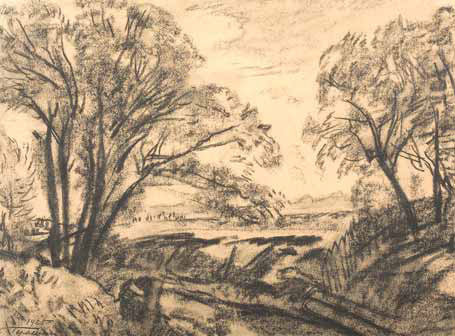 The “Milky Way” magazine was not the only environment in which the “Makovets” artists could meet. 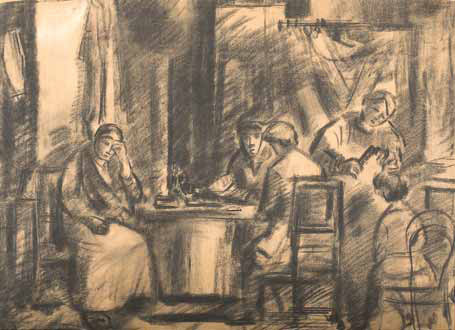 Some took part in the “Moscow Salon” and “World of Art” exhibitions, many taught or studied at the Moscow School of Painting, Sculpture and Architecture, which, according to Nikolai Chernyshev’s memoir, was the true cradle of the “Makovets” group. The School nurtured love not only for international art but for Old Russian art as well; here friendships with the founder of Rayonism Mikhail Larionov and famous writers and poets who studied at the art department were formed. The exhibition organizers tried, using the relatively small exhibition space, to present as fully as possible one of Russia’s best collections of drawings by the “Makovets” artists. The collection came about thanks to the efforts of Anatoly Bakushinsky, under whose direction in the late 1920s the Gallery acquired first-rate graphic pieces by Sergei Gerasimov, Leo Zhegin, Nikolai Sinezubov, Artur Fonvizin, Vasily Chekrygin, Nikolai Chernyshev, and Alexander Shevchenko. It should be noted that almost simultaneously with the small “Makovets” exhibition the Lavrushinsky building of the Tretyakov Gallery hosted a large show dedicated to the collecting activities of this great museum man and scholar, who wrote articles about the “Makovets” artists and organized their exhibitions at the Tsvetkov Gallery. In the early 1930s the graphic collection grew, with new acquisitions including pieces by Konstantin Zefirov, Mikhail Rodionov, and Pyotr Bromirsky. 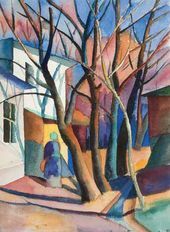 After the smaller associations of artists were willed out of existence and a single Union of Artists formed in 1932, the Gallery for a long time ceased buying works of many “Makovets” artists. 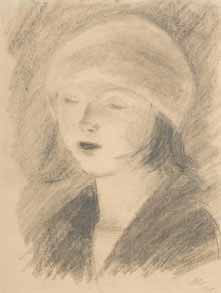 At that time some interesting artistic trends were snuffed out, usually for political considerations, and “Makovets” was no exception, because its artists, failing to adapt to the official doctrine of the building of socialist culture, were labeled as formalists and proponents of pseudo-realist art. Only the late 1970s saw a new wave of interest in the “Makovets” art — a time when new pieces were added to the already existing dedicated collections, and new collections put together. The Gallery then acquired for its graphic collection many of Sergei Romanovich’s works and some pieces by Nikolai Grigoriev, and later, in the 1980s-1990s, drawings by Yevgeny Mashkevich, Vera Pestel, Anton Yastrzhembsky, and by Raisa Florenskaya and Vadim Ryndin, who were apprenticed to the older “Makovets” artists. Bromirsky’s watercolour “Woman in a Pink Dress”, remarkable for its exquisite arrangement of colours, came to the Gallery as a part of a first-rate collection donated by the collector Alexei Sidorov in 1969, making a fine addition to the host of graphic pieces acquired in the 1930s. 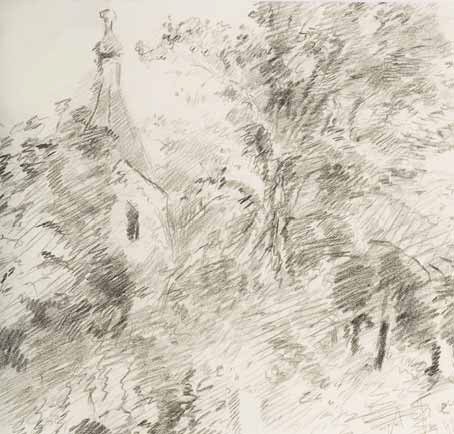 Thus the Tretyakov Gallery found itself the possessor of a major collection of drawings and prints by a wide range of artists, which was showcased at the Gallery’s exhibition of paintings and drawings by “Makovets” artists in 1994. Speaking about the collection, we have mentioned only artists whose pieces were displayed at the exhibition, whereas the collection in fact is much larger, comprising works of nearly every artist featured at one or another of the three shows. 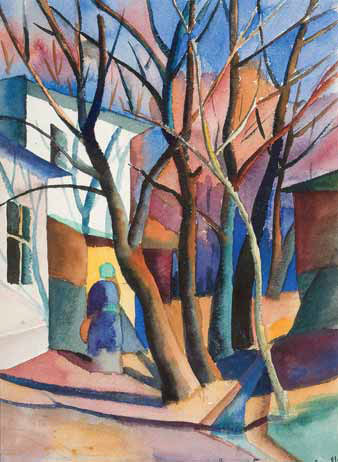 Enjoying great success, the shows were mounted at the Museum of Fine Arts (1922, 1924) and the Higher Arts and Crafts Workshops (VKhUTEMAS) in 1925, with more than 30 artists participating overall. 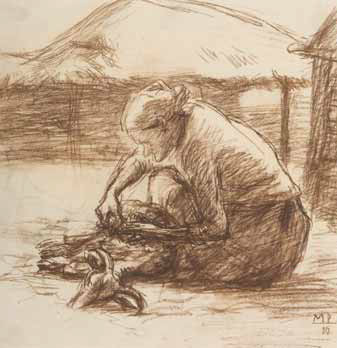 It is also worth mentioning that there were two shows of the Makovets artists’ drawings — in Moscow in the Tsvetkov Gallery (1925) and in Nizhny Novgorod (1925), evidence that the artists were especially keen on graphic art, whose means of expression enabled to create “a distilled image of enlightened flesh”, as Chekrygin wrote in his reflection on the creation of new forms. 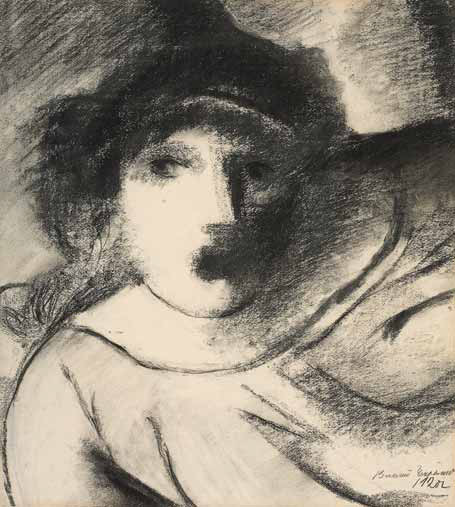 The works of avant-garde artists introduced a great diversity into the art scene of that period. The numerous groups of artists, varied in terms of organizational structure and worldview, who sometimes went as far as to completely reject art serving non-utilitarian purposes, were challenged by the Artists’ Association of Revolutionary Russia (AkhRR) with its commitment to themed paintings treating the topics of the day. 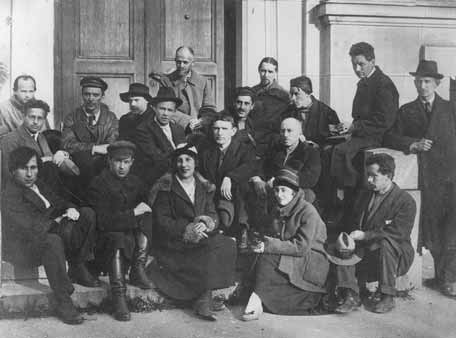 Such was the overall art scene, where a prominent place was occupied by the “Makovets” artists, who unexpectedly proposed “to lead the people to a high culture of learning and feeling”. Unlike the “left” artists — the creators of the new revolutionary culture — the “Makovets” artists never belittled the achievements of international realist art or maligned its substance. 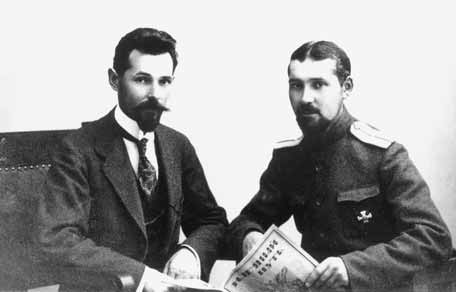 The “Our Prologue” manifesto, whose main postulates were elaborated by the recognized leader of the group Chekrygin, stated clearly that “revival of art is possible only when there is a clear line of succession from the great masters of the past and when vigour and immortality are resuscitated in it without fail”. 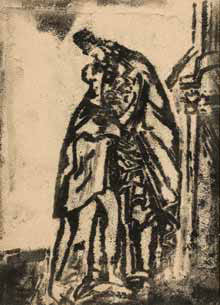 This piece, a programme unique in its emotional expressiveness and by no means a mere declaration, ran in the first issue of the “Makovets” magazine, which, in spite of all the hardships and discomforts of the time, was edited and published by Alexei Chernyshev in 1922. 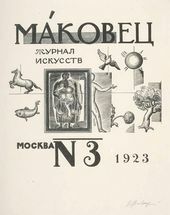 The magazine had literary, artistic and theoretical sections, which featured articles written by the “Makovets” members and Pavel Florensky, who eagerly responded to the offer of co-operation. The two magazine issues that were published featured reproductions of the artists’ works, literary oeuvres and critical essays, poems by Velimir Khlebnikov, Boris Pasternak, Nikolai Aseev, Pavel Antokolsky, Konstantin Bolshakov, Sergei Bobrov, Nikolai Barutin (Amphian Reshetov), Nikolai Livkin, Yevgeny Nedzelsky, and Yevgeny Shilling, and short stories by Nikolai Rudin and Alexander Trishatov. The magazine publishers, committing themselves to the difficult mission of service to Russian literature and art, had a dream of carrying out a grand project of publishing theoretical works and collections of poems tuned in to the spirit of the times, but their plans largely failed because of the shortage of funds. 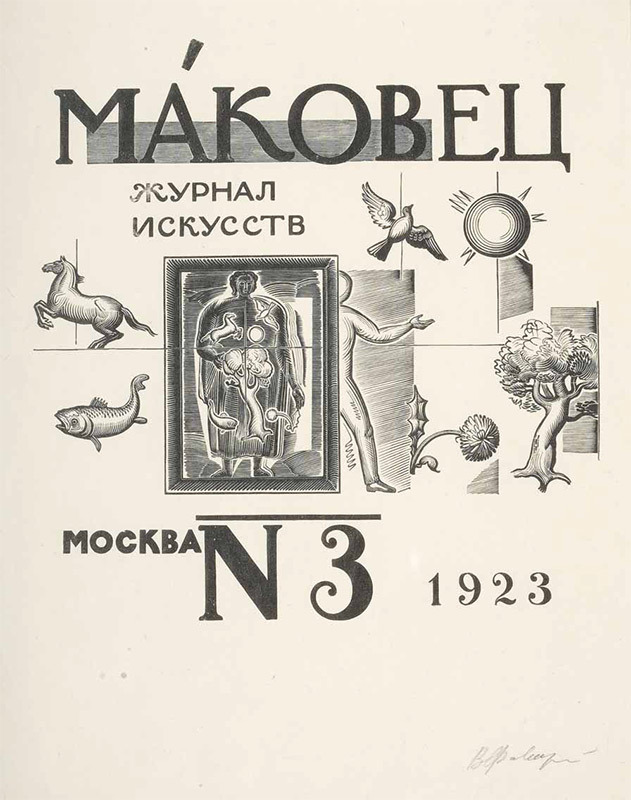 The third issue of the magazine was never published, and a superb print created by Vladimir Favorsky in 1923 especially for its cover — a piece poetically and imaginatively summarizing the “Makovets” artists’ worldview — became a sort of symbol of the group. It was the “Makovets” leaders’ firm conviction that only a fusion of the spiritual, poetic and philosophical elements will produce real imagery whose figurative language can alternate between the allegorical and symbolical and the realist. 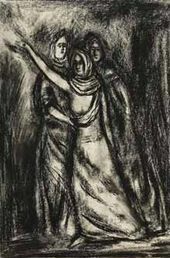 So the “Makovets” artists were especially fond of ideas about the transformative role and togetherness (“sobornost”) of art expounded by the Russian religious philosophers Nikolai Berdyaev, Vyacheslav Ivanov, Vasily Soloviev, Nikolai Fedorov, and Pavel Florensky. Thus, Chekrygin in an article published, after his tragic death, in the second issue of “Makovets”, likened the modern artist to a philosopher-metaphysician who “expresses abstract ideas through eloquent images of real life, beholding the idea of unity, which ‘transpires through matter’, as beauty that presents reality”. The symbolism of colour expressing a convergence between the real and the surreal was very important for many “Makovets” artists whose programme referred to resuscitation of “vigour and immortality” in art and the search for “relations between the material aspect (form) and spirit (the artist’s feelings and sensations)”. 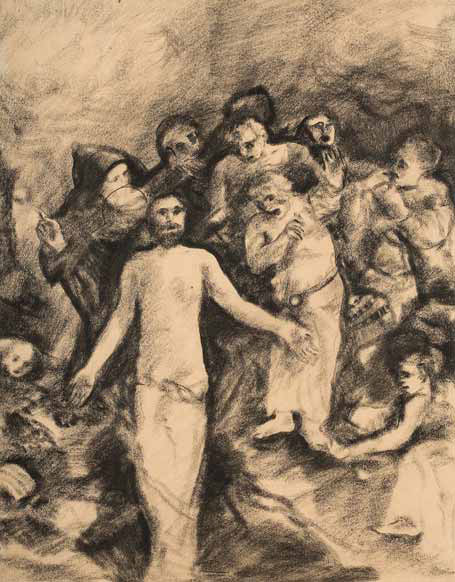 Not only Romanovich’s Gospel-themed drawings and prints (“Tale of the Prodigal Son”) and Ryndin’s light-suffused religious pictures are marked by inspiring luminosity, but other works as well — Zhegin’s genre pieces (“Family”), pieces by Zefirov (“Spinner”) and Rodionov (“Sheering the Sheep”), drawings and gouache pictures by Yastrzhembsky (“Verandah”), delicate penciled landscapes by Fonvizin, and Gerasimov’s drawings with their lusciously modeled images. A stream of light transforms human figures in Nikolai Chernyshev’s pieces (“Girl Singing in a Chorus”, “Girl with a Spray”), as if highlighting the depth of human souls and bringing out the beauty of eternal life and youth. The relentless artistic quest based on a profound knowledge of both Russian and Western European art led to discovery of new forms of expression. 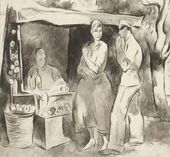 Thus, Gerasimov (“Threshing”), Shevchenko (“Tent on the Boulevard”) and Grigoriev (“Spring”), who became acquainted with cubism in its earlier stage, used in their compositions Cezanne’s method with the sole purpose of bringing into sharper focus the significance and beauty of the outside world.